Spis treści / Contents: JERZY MALINOWSKI, Introduction; JADWIGA RODOWICZ-CZECHOWSKA, Farewell to Professor Zbigniew Osiński; IGA RUTKOWSKA, Research on the reception of the theatre of East Asia in Poland: from the example of Zbigniew Osiński’s work; TRADITIONS: MEI SUN, The tradition and modern transformation of indigenous Chinese theatre or xiqu; BOGNA ŁAKOMSKA, Performances for the underground spirits . Terracotta figurines from ancient Chinese tombs; CHAN E. PARK, An inter-cultural discourse on p’ansori: the theatre of the imagination; YOKO FUJII KARPOLUK, Revived nō dramas: issues and perspectives; EWA RYNARZEWSKA, From village comedian to celebrity: metamorphosis of the Korean actor in the years of Japanese occupation (1910–1945); SANG WOO LEE, Between art and scandal: the actresses of Towolhoe and the gender politics of “scandal”; WEI LI, On female consciousness in contemporary xiqu in China; MARTA WESOŁOWSKA, The role of women in the musical life of early and medieval Japan. From naikyōbō performers to shirabyōshi dancers; MARTA STEINER, The corporeal mode of acting on the xiqu stage; ALEKSANDRA GÖRLICH, Kaoyo Gozen and attendants – relationships between the costumes of the kabuki actors of the Kanadehon Chūshingura play and their woodblock-print illustrations; MARY E. HIRSCH, What does Chinese Shadow Theatre tell us? ; MARIANNA LIS, Wacinwa . History of the Chinese minority in Indonesia and its Chinese-Javanese shadow puppet theatre; BEATA KUBIAK HO-CHI, Tragedy and the tragic in the Japanese puppet theatre . Imported or native categories? ; IGA RUTKOWSKA, The need to laugh – comic elements in Japanese performing arts – on the example of kabuki theatre; MAURYCY GAWARSKI, Chinese opera theatrical poster in Beijing in the first half of the twentieth century; INSPIRATIONS: BARBARA KAULBACH, Chinese theatre at the crossroads – Ouyang Yuqian and the West; MARTIN NORDEBORG, Translated Western plays as a symbol of modernity in Japan of the 1920s. 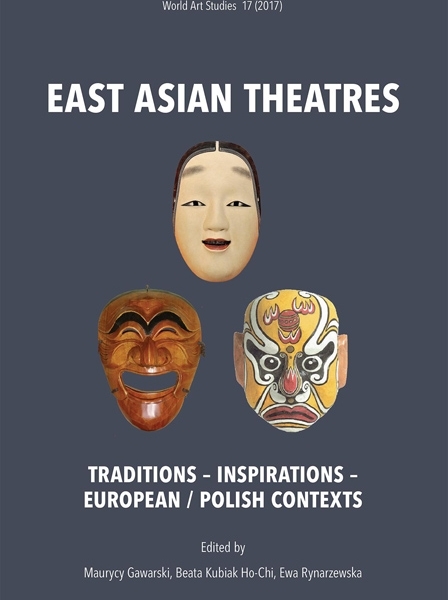 ; INSOO LEE, An intercultural call from the Third World: Jaram Lee’s Brecht pansori, Sacheonga; ESTERA ŻEROMSKA, Some reflections on Mask by Mori Ōgai; TAKASHI INOUE, The particularity and new possibilities of Mishima’s dramas; JOANNA WOLSKA-LENARCZYK, The concept of romantic heroism in Mishima Yukio’s play My friend Hitler; KEI HIBINO, Making comedy naturalised and vulgar: the theatre of Soganoya Gorō, the Japanese King of Kigeki; KLAUDIA ADAMOWICZ, Searching for the fantasy: the theatre of Takarazuka; MONIKA LECIŃSKA-RUCHNIEWICZ, Entering the “world of dreams”. The interior and exterior of Takarazuka Grand Theatre; YING LI, Theatre and politics in China (PRC) in the recent years; HIROSHI KOMATSU, Similarity and difference . Japanese cinema on the borderline 1907–1923; MAGDALENA FURMANIK-KOWALSKA, Chinese opera (xiqu) as a significant element of contemporary artwork; EUROPEAN / POLISH CONTEXT: YUN WANG, Justice or yi: the fate of The Orphan of Zhao being deconstructed in Europe; MARKÉTA HÁNOVÁ, Sada Yakko and the reception of Japanese theatre in the context of Japonisme in the Czech lands; EMI YAGISHITA, Sada Yakko’s and Hanako’s performances: images of exotic Japan in the West in the early twentieth century; KATARZYNA DEJA, Józef Jankowski’s play Kesa as an example of transculturality in Polish modernism; MONIKA CHUDZIKOWSKA, A Chinese Play given in the Chinese Manner. The Yellow Jacket by Joseph Henry Benrimo and George Cochrane Hazelton on the Polish stage; KATARZYNA WODARSKA-OGIDEL, Recipe for a fairy tale: a Japanese performance made by Polish P.O.W.’s in 1941; SEUNG SUK BAIK, Imagined geographies of city space in 1942: Seoul, Shanghai, Warsaw, Tokyo; WIESNA MOND-KOZŁOWSKA, Western aesthetics needs turning to nō theatre; JADWIGA RODOWICZ-CZECHOWSKA, Tadeusz Kantor in the theatrical life of Japan, 1979–2015 . Introductory remarks; * * *: MAURYCY GAWARSKI, Polish research on Chinese theatre since the beginning of the twentieth century to the present day; MAURYCY GAWARSKI, List of Polish publications on Chinese theatre since the beginning of the twentieth century.